We carry 53 varieties of roses, and ship only the freshest and most beautiful at the time of your order. 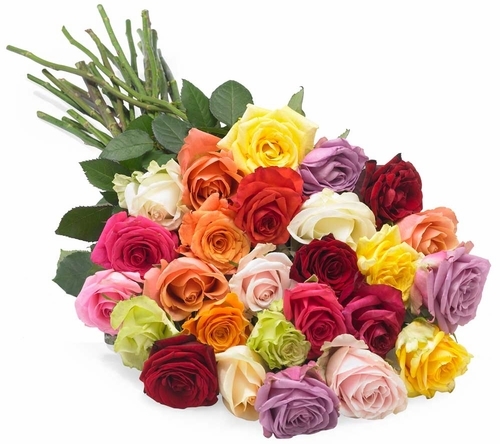 Therefore, when ordering mixed roses, and since each variety has different characteristics such as head size and stem length, any given bouquet will be different than the last and may differ slightly from what is displayed here. You can be assured only the finest roses will be shipped. We guarantee you will be satisfied with the quality and freshness of our roses and if not, we will gladly re-ship or refund your purchase. Orders should be opened immediately upon receipt, and for the best results, please follow the care instructions that are enclosed. If you are not satisfied with our roses, simply call or email within 10 days of receipt of your order. Keep in mind that our roses are shipped directly from the farm to your door and do not pass through the hands of a wholesaler or florist. Florists usually clean up the roses by removing the dryer and wrinkled outer "guard petals" before you purchase them, and while this improves the initial appearance of the roses, these petals are a natural part of the rose and important to their lifecycle. Removing the outer guard petals will have an adverse affect on the vase life and performance of the bouquet. You will notice that as the rose blooms, that the guard petals will peel back behind the inner petals and they will not be visible. Your roses may arrive a bit thirsty after the overnight trip to your door. Please note that the outer "guard petals" may be bruised and slightly brownish or greenish in color, but don't let that fool you. This is completely normal. We do not remove these outer petals as described in the above paragraph. Once they are properly trimmed and placed in water they will re-hydrate, perk up and continue to open over the next several days to reveal beautiful California Blooms! We ship anywhere in the USA and only via FEDEX Priority to help ensure the freshest roses and timely deliveries. 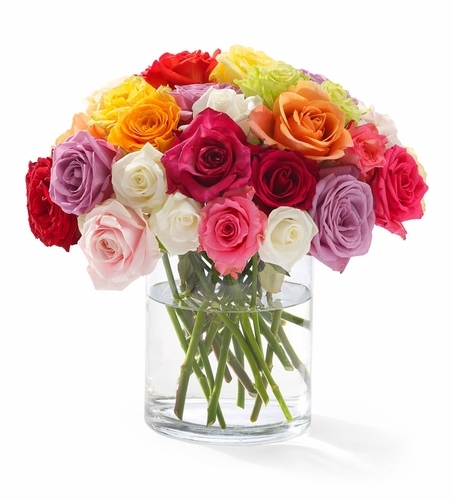 A shipping & handling fee of $20 applies to each bouquet that is shipped. Additional fees apply for Saturday deliveries (+$15) and orders shipping to Alaska and Hawaii (+$15). Order deadline each day is 1:30pm PT for delivery the next day. Most orders arrive before 12:00 noon local time. Please note that morning delivery is not available in some rural areas. In those cases, delivery is generally made by 5:00pm local time. What Days Of the Week Are Deliveries Made? Deliveries are made every day of of the week except major holidays, Sundays, Mondays. Why Aren't There Deliveries On These Days? Major Holidays & Sundays: Our shipping companies do not offer delivery service on these days. Mondays: We do not offer Monday deliveries since it would compromise the freshness and quality of our roses. How about bulk orders and shipping costs? If you have a need for a bulk order of 75 roses or more, please call us or drop us a line. Many parts of the USA are experiencing extreme weather this time of year and it's important to know that roses - being very delicate - do not hold up well in either very low or very high temperatures. In addition, we ship all orders via FedEx Overnight, and very cold weather often results in service delays. We ask that you do not send our roses into these areas to avoid the disappointment and waste. You should always check the Local Forecast for the recipient's location and desired delivery date prior to placing your order, since we are not responsible for weather related damage. We are happy to help further, so please give us a call at 888-600-8865.